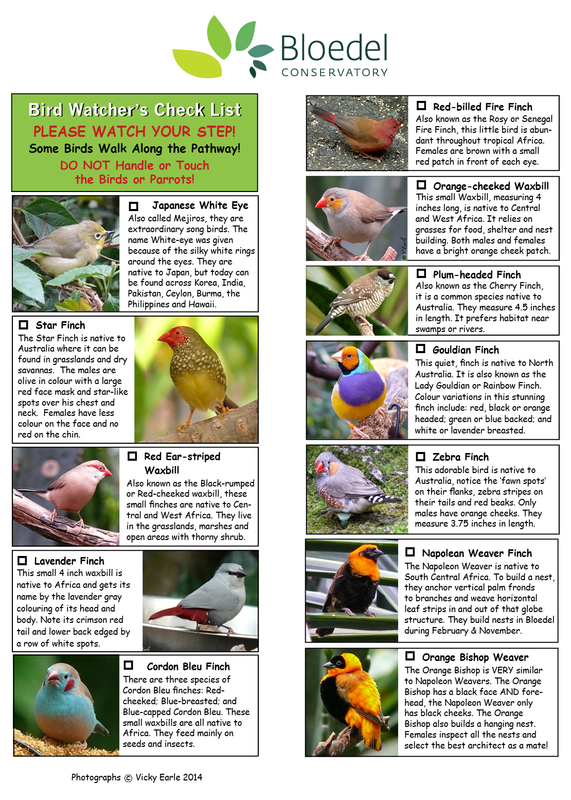 We are pleased to offer the newly updated Bloedel Conservatory Bird Watcher’s Checklist online! 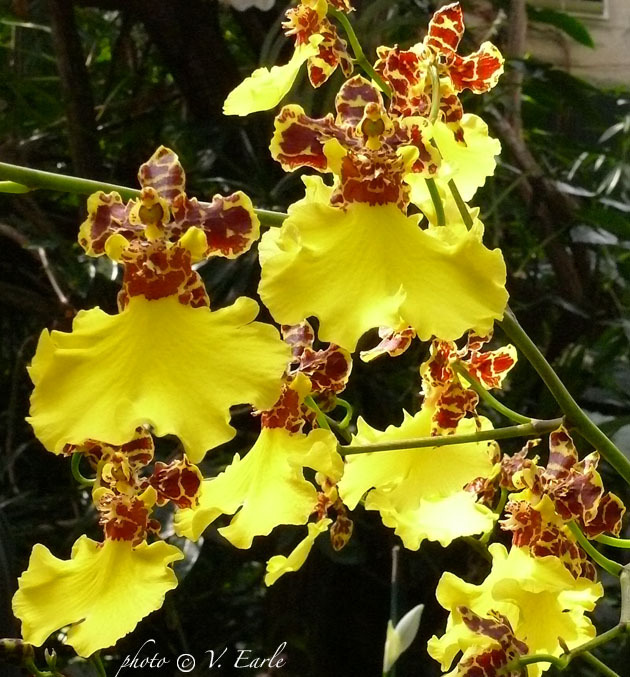 It’s free to download or simply bookmark the link below and pull it up on your Smartphone or tablet when you visit the Conservatory. We have lots of new birds. Come by soon to see Bearded Reedlings, Roul Roul Partridges (and their babies), Pekin Robins and of course all of your favorite feathered friends. Enjoy! 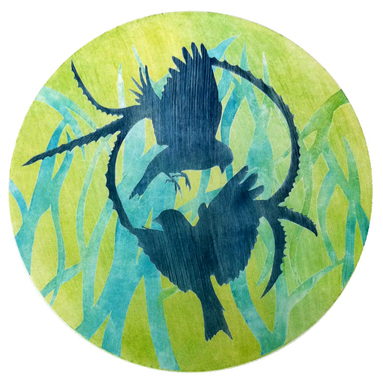 Paula Grasdal is a Vancouver mixed media artist, printmaker, and graphic designer. She is also one of the new dedicated Roving Docents volunteering at the Bloedel Conservatory. 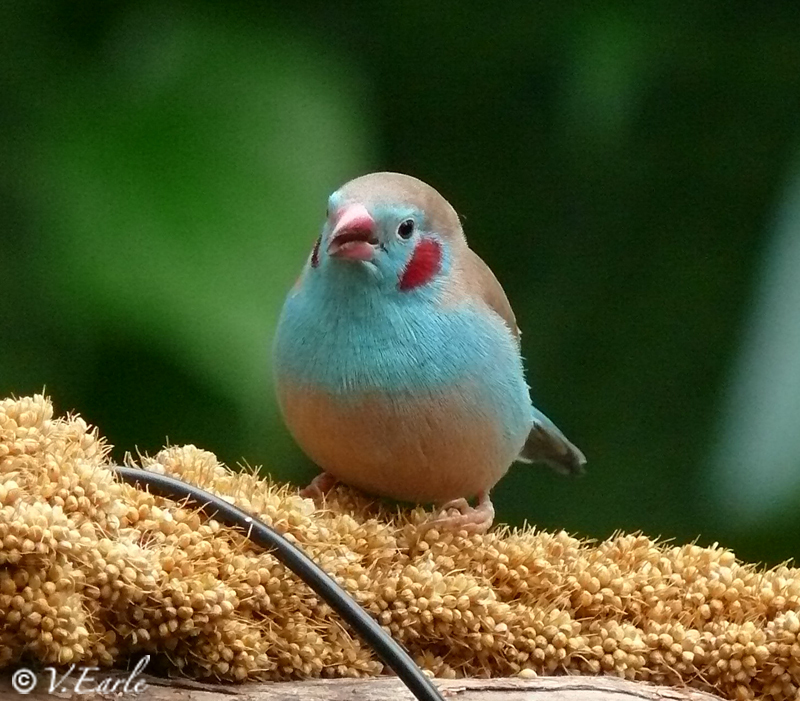 The amazing birds at Bloedel – especially the exotic finches – became Paula’s source of inspiration. 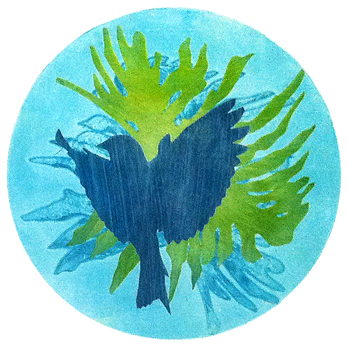 A number of prints in this series, along with artwork by co-exhibitor Rosalind Rorke, make up the “Recurrence” exhibit, now on display at the Dundarave Print Workshop on Granville Island until June 29. 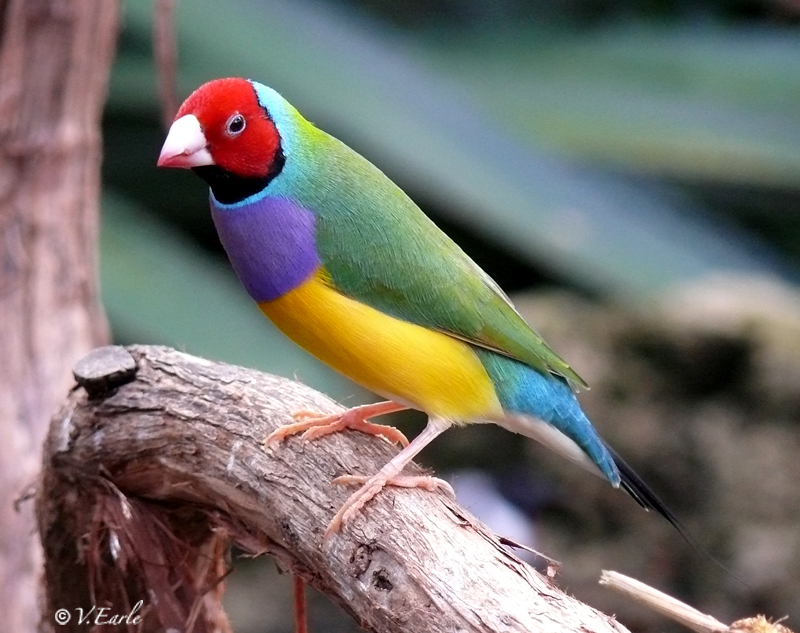 Paula began by taking a series of photographs of gouldian finches and various botanical specimens at the conservatory as source material for the imagery. She incorporated a circular motif to mirror the building’s shape. These prints incorporate abstract patterns, shadows and shifting perspectives to evoke the sense of a “fleeting glimpse of something seen and then remembered with a skewed perspective”. Inspired by repetition — cycles in nature and patterns in design — the flora and fauna is drawn from the artists’ experience and vision of the natural world. Her artwork has been featured in publications such as “Mixed Media Collage” by Quarry Press and is in private collections in the U.S. and Canada. 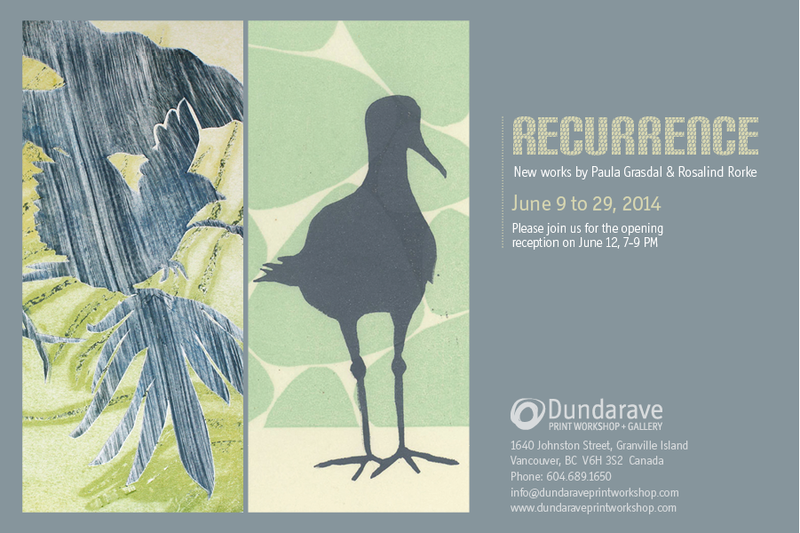 Be sure to catch “Recurrence” at the Dundarave Print Workshop (in the Net Loft across from the market) at Granville Island. 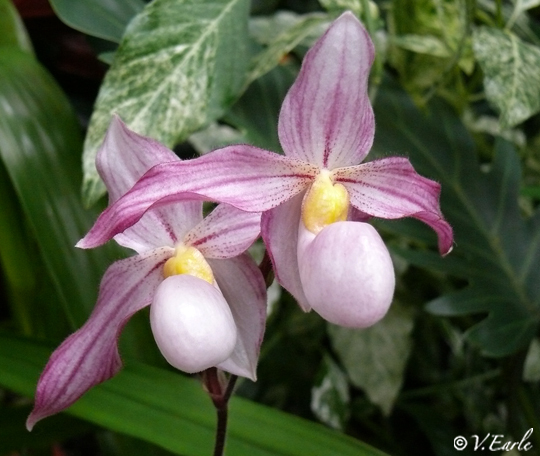 The Roving Docents, on hand every weekend at the Bloedel Conservatory, are also looking forward to your visit. They have amazing stories about the plants and birds that live there and can’t wait to share them with you. 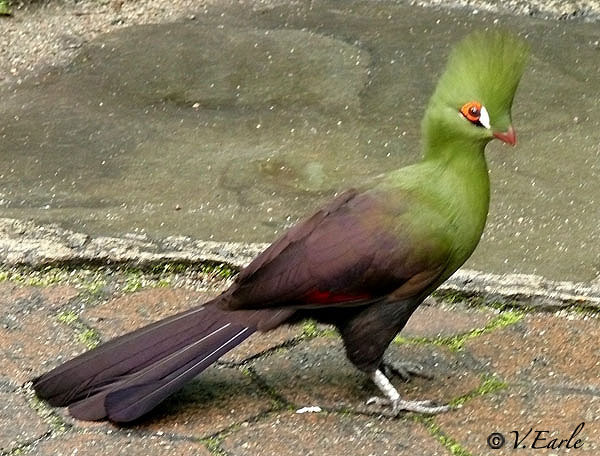 Come catch a glimpse of the exotic finches and get inspired! Looking for a great place to go on the Easter long weekend? Come in to the warm lush tropical atmosphere of the Bloedel Conservatory and get crazy about cockatoos! 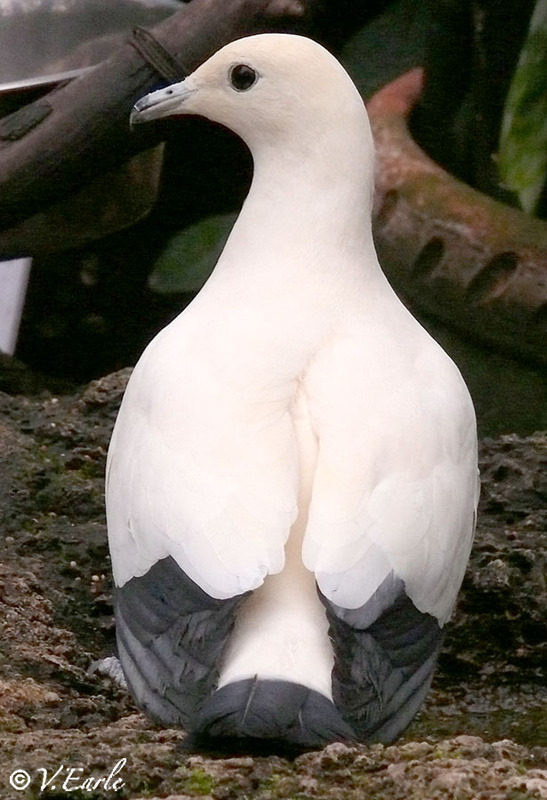 You have likely already met Malibu, the Sulphur-crested cockatoo? She as been with the Conservatory for nearly a year and has settled in beautifully. If you stop and say “Hello!”, she will likely give you a loud ‘Hello’ right back and maybe show you some of her best dance moves! And she is now in good company with other birds in the Cockatoo family: Gidget the Citron-crested cockatoo and Kramer, the Moluccan cockatoo. Gidget also arrived with her best buddy of 15 years: Rudy, the African Grey Parrot. The Bloedel Conservatory is very fortunate to have been chosen as the new forever home for all of these incredible birds. 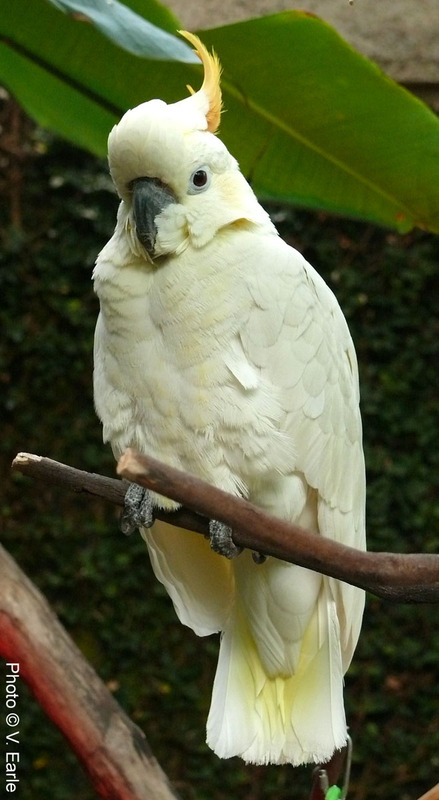 Citron-cockatoos are smaller than Sulphur-crested cockatoos, have a more orange-coloured crest and soft yellow patches on their cheeks and under their wings. 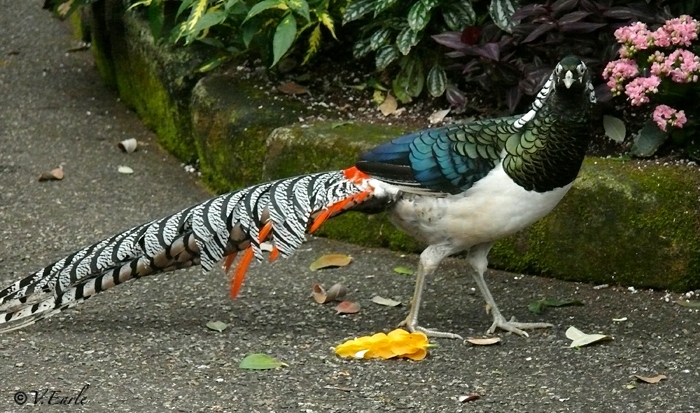 They are a quiet species compared with all the cockatoos and are not as good at imitating human speech as some members of the parrot family. Gidget is the sweetest little cockatoo and loves to give kisses, but you have to listen very carefully! Kramer, the Moluccan cockatoo, on the other hand has a large vocabulary and is not shy about letting you know it! He says things like “Hello, Good Morning”, “Peek-a-boo”, “Kramer is a good bird”, (often followed by “Kramer is a bad bird”), “What is that?”,“I’m a bird”, “Let’s party”, “Surprise!”, “Bye-bye”, and “Good night”. Sometimes his language can even get as colourful as the plants at the Conservatory! Watch the video at ‘The Last Word: Dirty Bird Talking’ on the CTV Vancouver website (scroll to page 3 once you arrive). 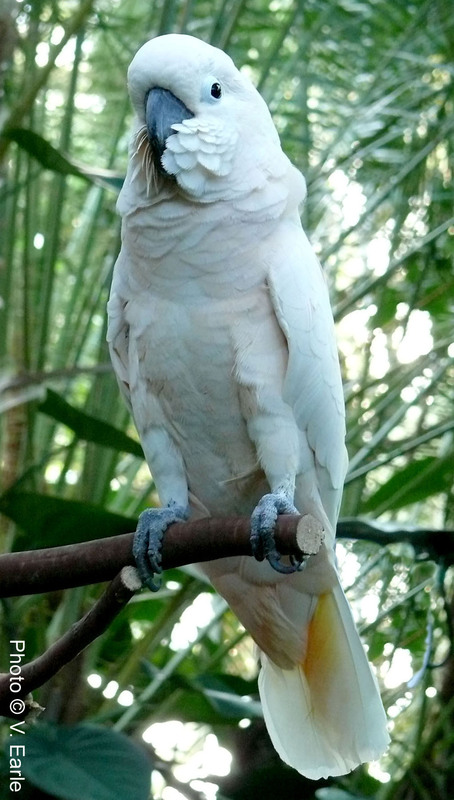 Moluccans are the largest of the cockatoo family and are extremely intelligent. Kramer also loves peppermint tea, baseball hats, and is a very good dancer sometimes swinging upside-down from his perch and putting on a show. Rudy arrived at the Bloedel Conservatory with Gidget. 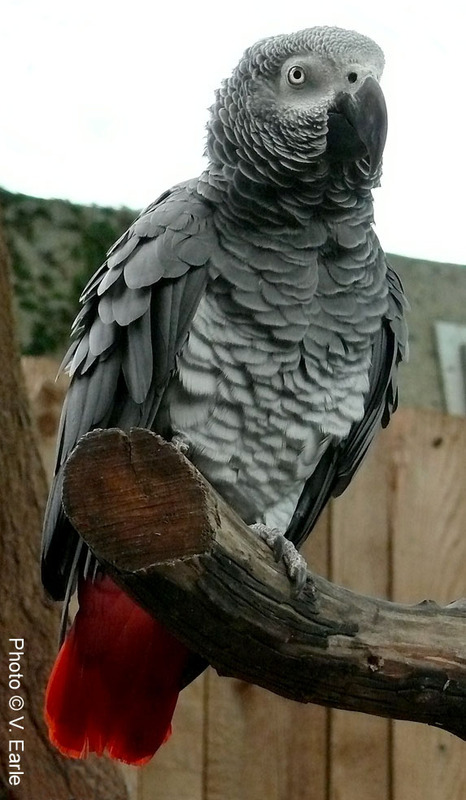 Rudy is a 16 year old African Grey Parrot and also has quite a good vocabulary. She is also the master of whistles and weird, wonderful sounds. She will say “Hello!”, “Gidget”, loves to do her cat imitation, and if you sneeze, she will politely say “Bless you!”. African Grey Parrots are loving, playful, and bring joy and laughter into the lives of all who have the pleasure of knowing one. 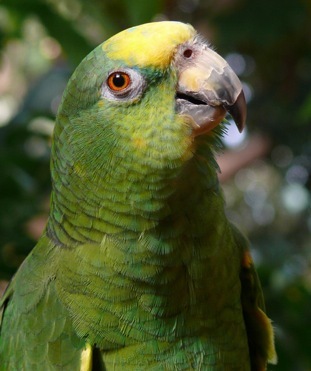 They are known as the “Einstein’s” of the parrot world because of their incredible talking ability. African Greys are considered to be among the most intelligent of all birds, ranking alongside dolphins and chimpanzees for their ability to associate human words with meanings, shapes and colours. 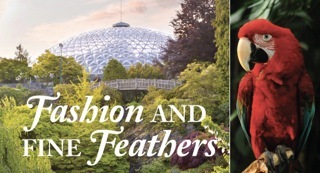 All the birds at the Bloedel Conservatory have either been directly donated to the Conservatory from homes that can no longer keep them or have been adopted from the GreyHaven Exotic Bird Sanctuary. 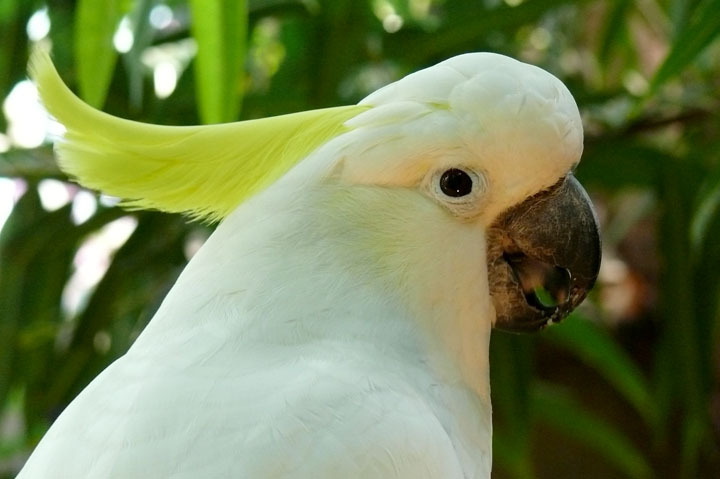 GreyHaven is a local non-profit organization that specializes in parrot rescue, rehabilitation and adoption. They actively promote avian welfare and awareness in the community through educational seminars and presentations. A great way to round out your visit to Bloedel is with lunch or dinner at Season’s in the Park Restaurant. It’s open all Easter long weekend and offers one of the best views Vancouver has to offer. Go to their website: http://www.vancouverdine.com/seasons-park for more information, specials and to make reservations. Now that the Conservatory roof replacement project is well underway, Bloedel is a perfect family friendly and affordable retreat rain or shine, is wheelchair accessible and is open everyday. With lush plants and over 200 exotic colourful (and entertaining) birds, it’s a perfect destination spot in the city. Hours, prices and more info can be found on the Vancouver Parks website. Come for a visit! The birds can’t wait to meet you! 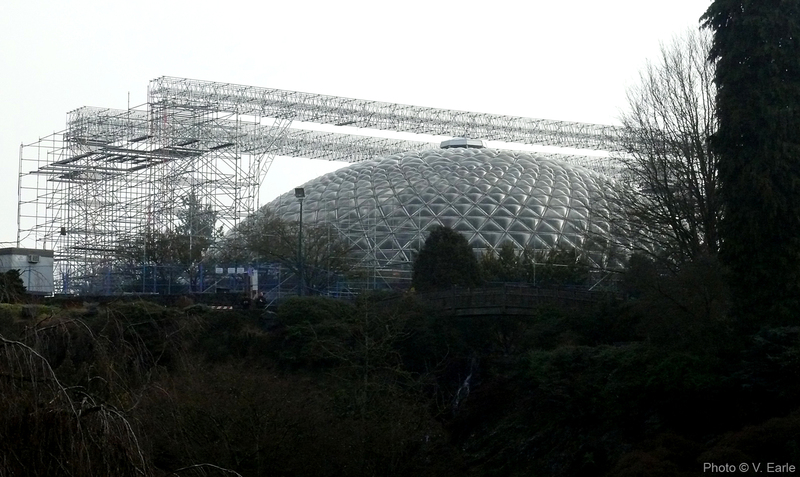 Bloedel Conservatory Update: Big Things are Underway! 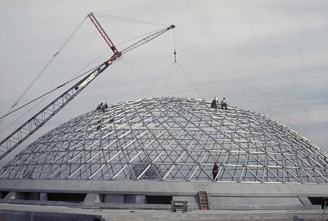 The Bloedel Conservatory Roof Replacement Project is now underway! 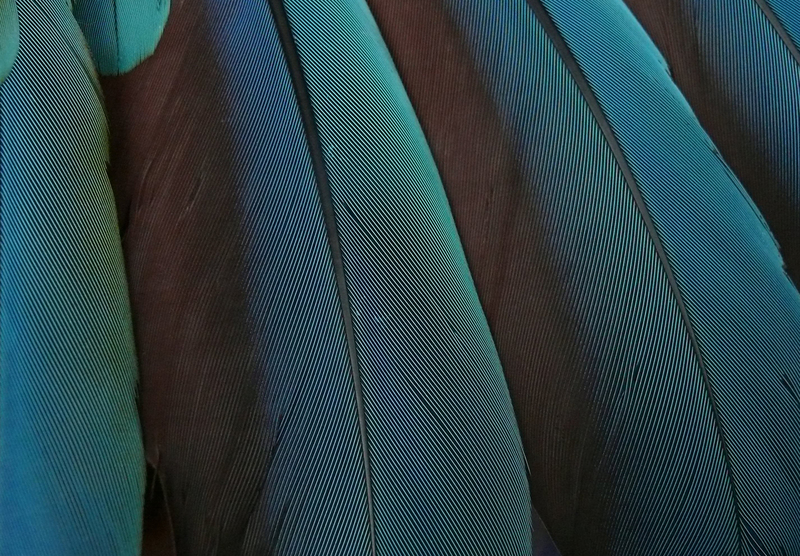 Join costume historian Ivan Sayers for “Fine Feathers Make Fine Birds”, for an entertaining evening on the use of feathers in twentieth-century fashion. Mr. Sayers will show examples and regale the audience with his vast and knowledgeable stories on the topic. This lecture will be held in the Great Hall at VanDusen Visitor Centre, VanDusen Botanical Garden, 5151 Oak Street. Parking is free. Purchase tickets by phone: 604-257-8190 or in person at the VanDusen Admission Desk during Garden hours. Come in and rediscover Bloedel with our new Family Programs, for children ages 5–11 years of age. Programs run during February and March. Learn something new while staying warm during these winter months in our little corner of tropical paradise! Groups will meet inside the Conservatory. An adult must accompany the child(ren) for the entire program. All programs are fun for the whole family. Mark your calendars! Tropical rainforests are home to many plants that we use in our daily lives. 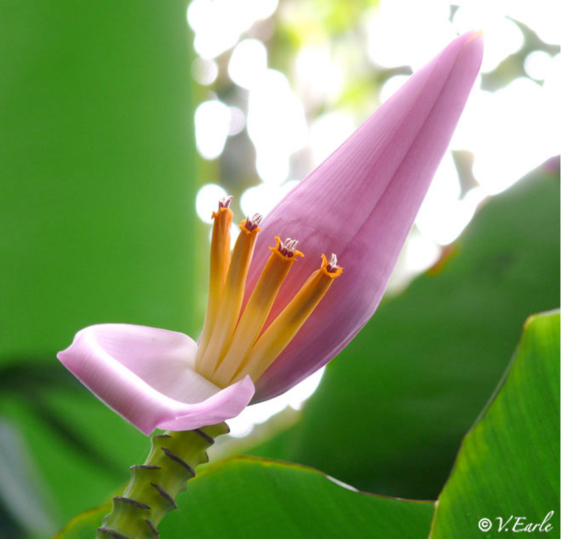 Visit our ‘incredible edibles’ station and learn more about the orchid that vanilla flavouring comes from, the coffee tree, plantains and many more tasty tropical treats. 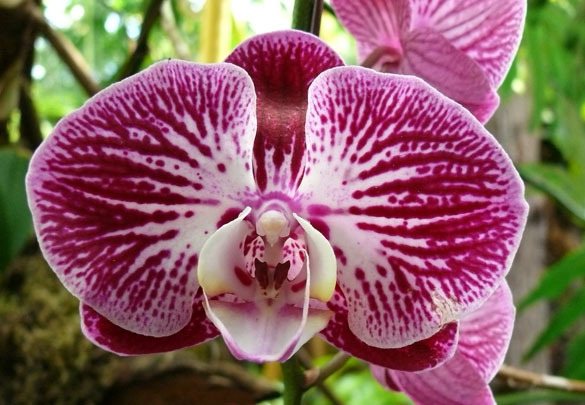 Test your knowledge with our mouth-watering match up game and search the beautiful Bloedel Conservatory for these plants. Explore Bloedel Conservatory with a watchful eye on the birds that flit, flutter and fly in this rainforest oasis. Visit the “bird brain” station to receive a series of clues to help you find some specific feathered friends while touring the site. You will receive a bird stamp as a reward for completing the challenge and get a chance to eat like a bird with a variety of bird beak props. 10:30 a.m. – noon OR 1:30-3 p.m. Registration required. 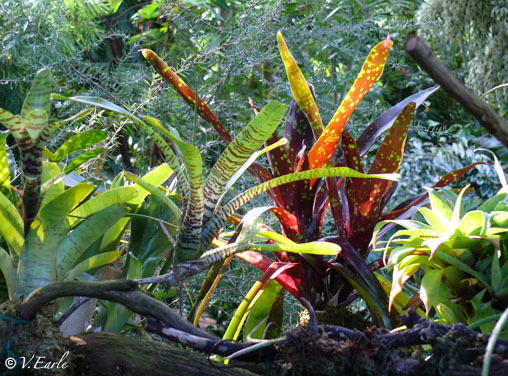 Take a tour of the Conservatory and uncover the interesting and amazing world of epiphytes and bromeliads. 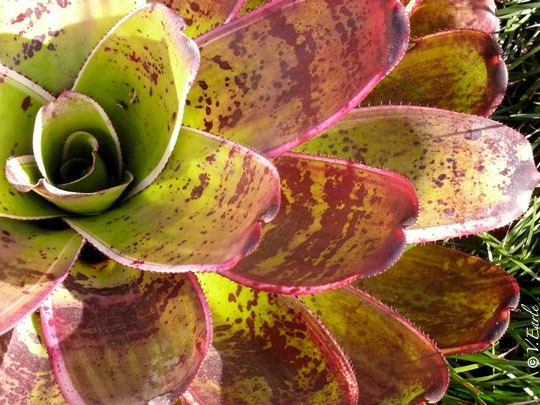 We will investigate the creatures that depend on these plants and use a microscope to peer into the mini ecosystem that thrives within a bromeliad. You’ll also be creating a take-home mini rainforest terrarium with an air plant! To register: Call 604-718-5898 Tues – Fri, 10 a.m. – 4 p.m. or email: familyprograms@vandusen.org. Along with the new programs, be sure to plan a visit for the Family Day long weekend, February 8 – 10 to meet our new Roving Docents! They have been training hard and will be on hand all weekend to share intriguing stories on the exotic plants and birds that live under the dome. They will happily point out species that are easy to miss and answer any questions you may have. 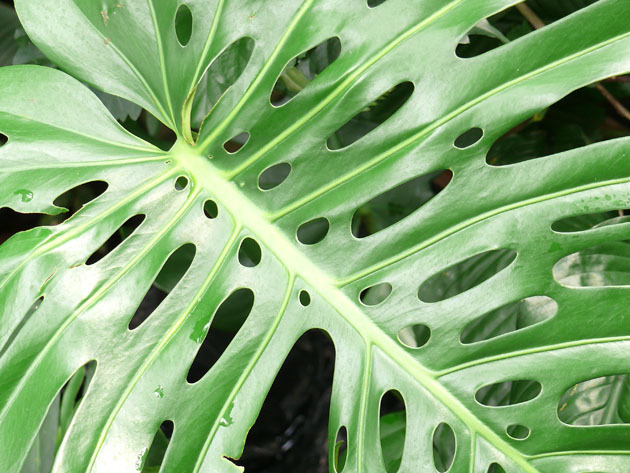 Growing Rainforest Plants at Home – February 23, 2014, 11 a.m. – 12 p.m.
Did you know that you can grow many of the plants found at the Bloedel Conservatory right in your own home if you give them the proper care and conditions? Join instructor Egan Davis on a walk through the conservatory focusing on these plants and the techniques to grow them. He will also share stories about their native rainforest habitat, pollinators and more. VBGA member price $10 / Non-member price $15. Registration is a must: Call 604-718-5898 or visit: http://bit.ly/1apch3U to download a registration form. There are big projects, programs and events underway at the Bloedel Conservatory throughout February and March! 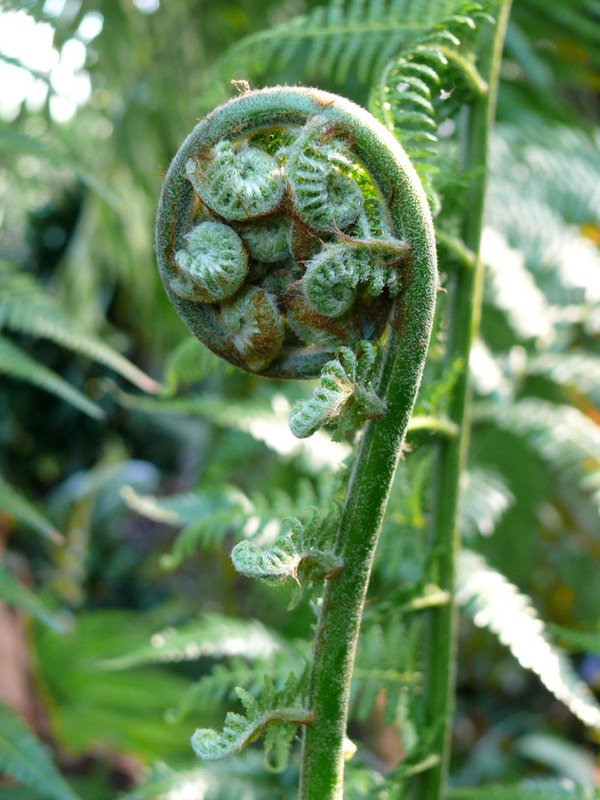 Be sure to support our green jewel and take part in the fun of Rediscovering Bloedel! 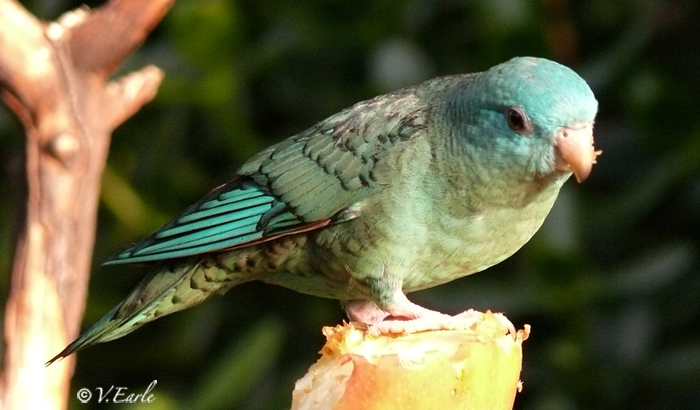 100 New Birds Grace the Bloedel Conservatory! Imagine all the colours of a rainbow wrapped around one tiny adorable little bird! Now multiply that times 60! It is truly a sight to behold! 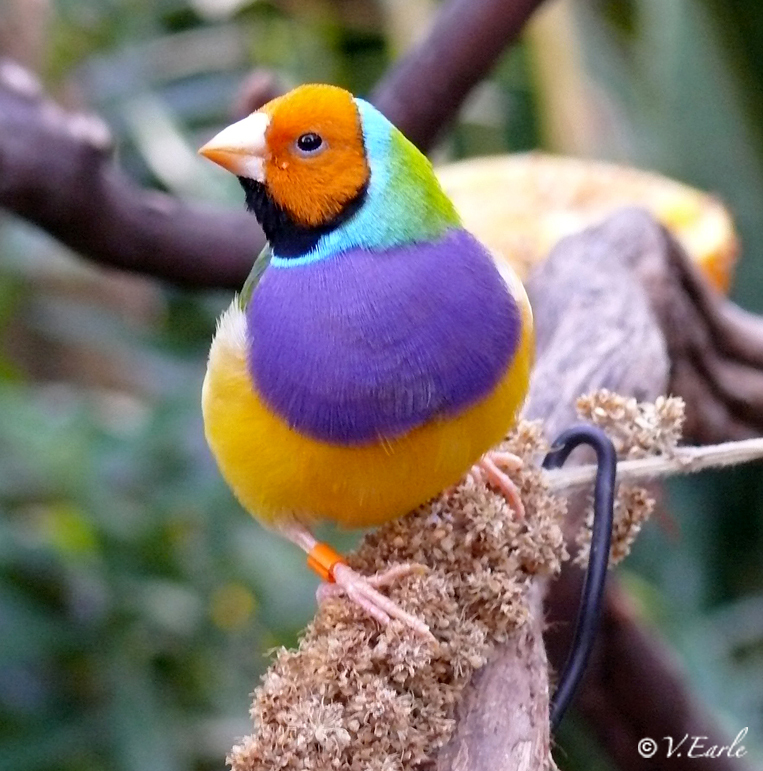 A variety of gorgeous new exotic birds including gouldian, saffron, lavender, cordon bleu and fire finches now grace the Bloedel Conservatory. All thanks to a tremendous donation by a private hobby breeder from Calgary. She selected our green jewel at the top of Queen Elizabeth park as the perfect recipient of these small bundles of wonder. After receiving thorough check ups from Night Owl Veterinary Clinic, over one hundred new birds now call the Conservatory home! 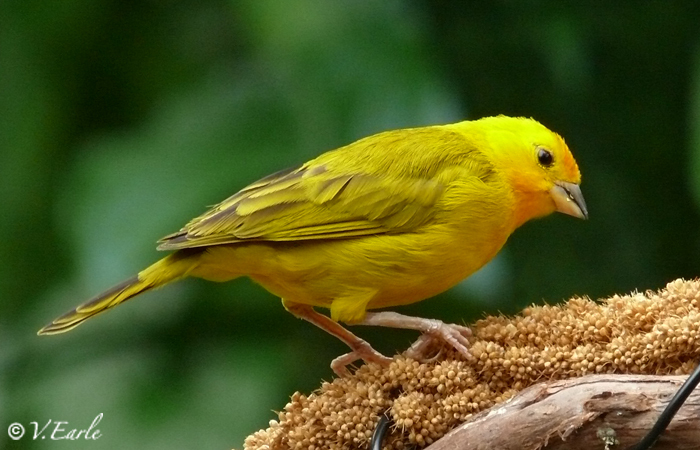 The tropical and subtropical environment in the dome are ideal for these types of finches. 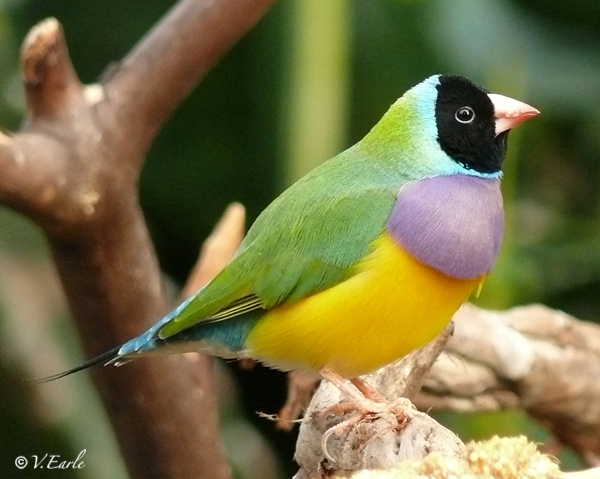 Even though gouldian finches, native to Australia, make up about 60% of the donation, the Conservatory’s African finch collection has also gotten a big boost. Red-cheeked cordon bleu, gold breasted waxbills, grey and green singing finches and red fire finches are among the recent additions. Wednesday, August 21st at 6:30pm! 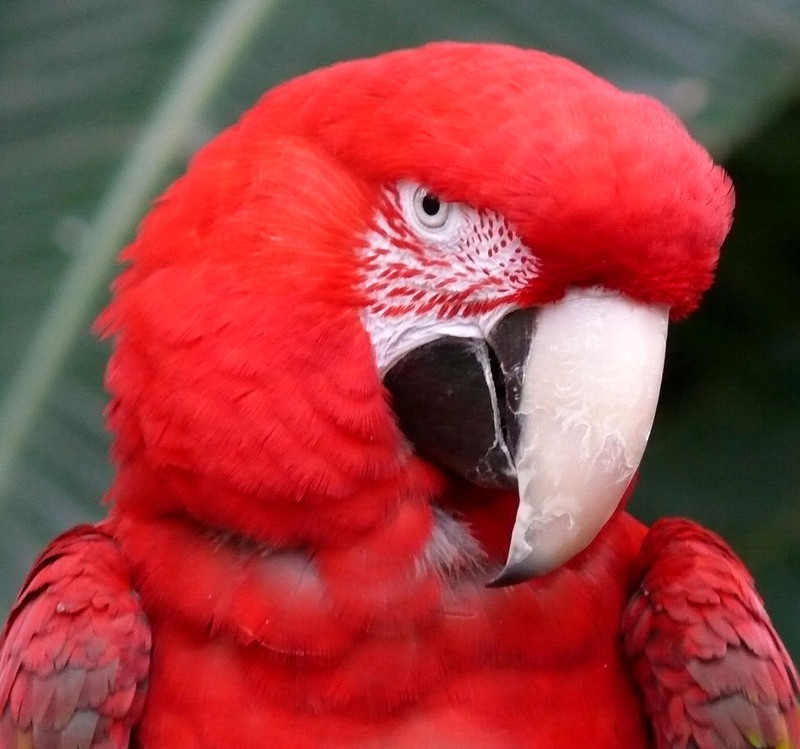 Join Jenny Tamas, Adoptions Director from the Greyhaven Exotic Bird Sanctuary, who will introduce you to the all of the parrots, macaws, and of course the smaller birds that live at the Conservatory. She will share interesting facts about each species, as well as the care required, diet considerations and tips for keeping your own feathered companions healthy and happy. Cost to attend the walk is $10 for VanDusen members and $15 for non-members, which includes admission to the Conservatory. Pre-registration is a must! Register online, by phone, in person or by fax. Visit the VanDusen Botanical Garden Adult Education Registration page for all registration information. So, what are you waiting for? 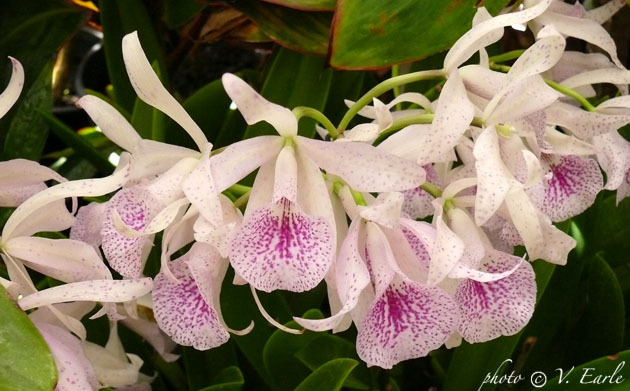 Grab your camera and get up to the Bloedel Conservatory! Your whole family will be delighted by the exotic sights and sounds. It’s always a great day for a visit! The birds can’t wait to meet you! 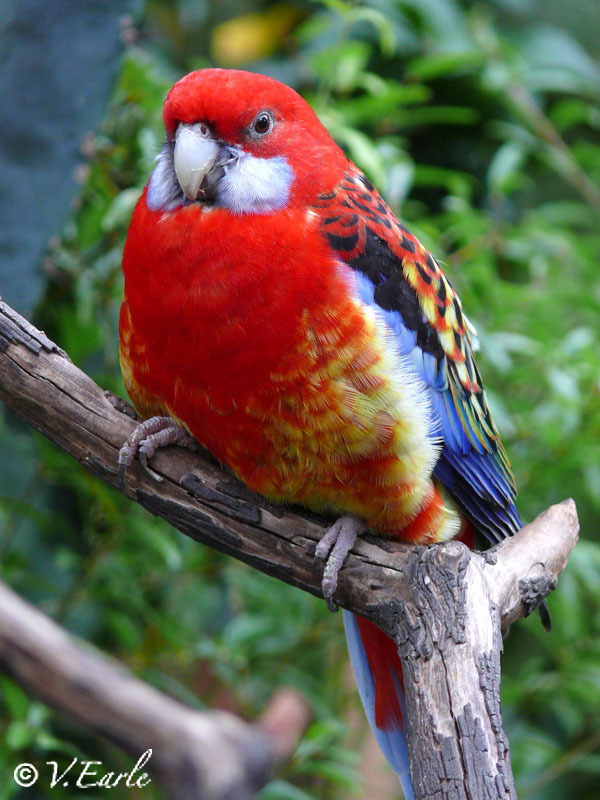 Clyde, the beautiful Eastern Rosella parrot, recently escaped through a vandalized plexiglass bubble at the Bloedel Conservatory in Queen Elizabeth Park. Fearing the worst, worried Conservatory staff and Friends of Bloedel volunteers searched day and night throughout the park. Hopes were lifted when his calls were heard and excited relief spread when he was was spotted in the antennae structure atop the dome. But now how to get him down? 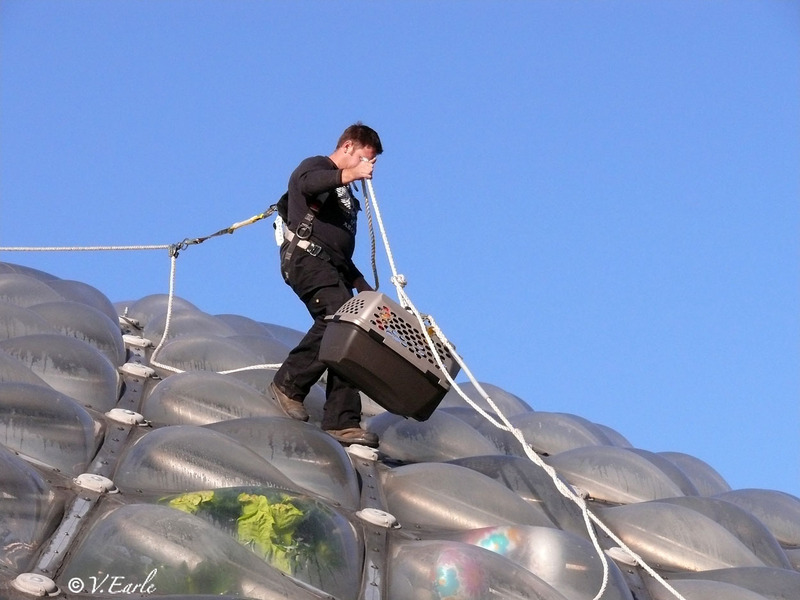 Luckily, the team from Spectrum Skyworks, who were on site to repair the damaged plexiglass bubble, stepped into quick action. Their high level rope access training and specialized rope and safety equipment allowed them to perform the rescue safely. 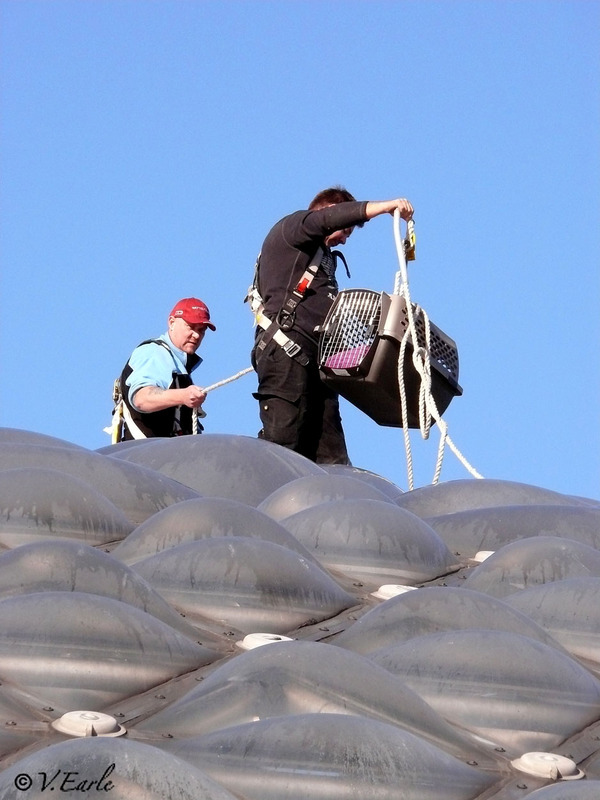 The team took tremendous care to get the little bird down from atop the 70 foot dome. Special thanks goes out to Wayne, Neil and Scott for their great work in coaxing the Eastern Rosella into a transport carrier and getting him to the ground safe and sound! Clyde was smart to find his way into the structure. He was protected inside the metal and grated structure from the outside elements and predatory eagles, while the rising heat from the dome kept him warm through chilly nights. 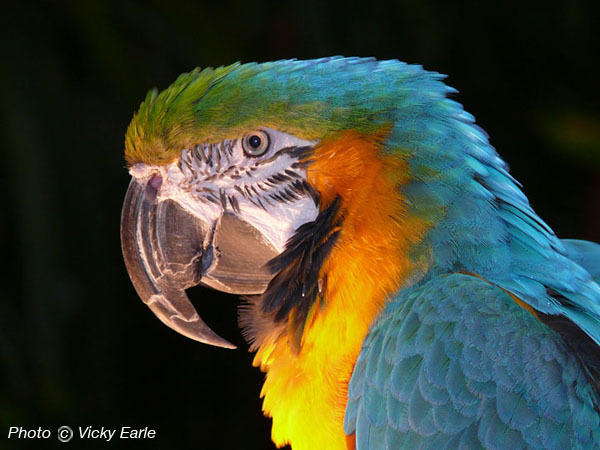 Clyde is no stranger to adventure: he flew into the open doors of a fire hall over 12 years ago and was taken in by Greyhaven Exotic Bird Sanctuary before coming to the Bloedel Conservatory. 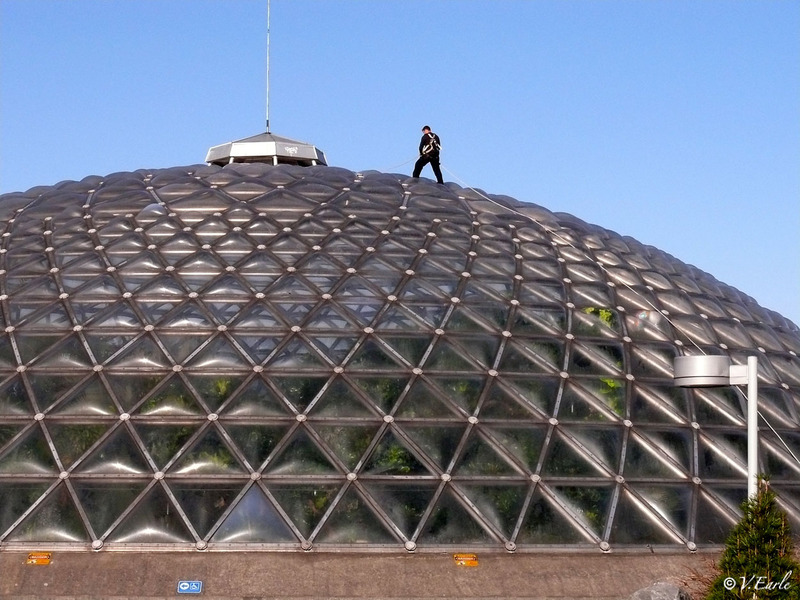 He has thrived in the lush tropical atmosphere inside the dome. Clyde is doing well and is expected to make a full recovery from his recent big adventure. A BIG thank you goes out to the dedication and commitment of all involved!